Want to learn Copperplate Script? Cliff Mansley attended the famed Zanerian College of Penmanship in Columbus, Oho where he learned several calligraphic hands. He has taught workshops in Copperplate Script and Old English, and has studied calligraphy under numerous well-know teachers and participated in more than 10 International Calligraphy Conferences. Mr. Mansley is a past president of the Portland Society for Calligraphy and is a founding member of both the Association for the Calligraphic Arts and the Foundation for the Calligraphic Arts. He has been a member of the Association of Master Penmen and Engrossers since 1972. This distance learning course consists of 10 lessons and can be taken by anyone wishing to learn Copperplate Script but can’t find a workshop in their area. The course starts with the basic strokes involved in the copperplate script. It explains the formation of the lower case and upper case letters, going step by step. Finally the lessons lead you into forming whole words and sentences. Completed lessons are best sent by US mail. A description of the supplies and many helpful suggestions and tips learned over more than sixty years of practice are included. 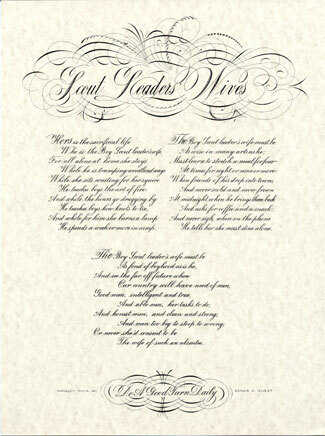 Participants receive a personal critique of each lesson that is submitted including hand lettered examples when necessary. More than 45 pages of instructions and exemplars are provided to each student. The originals of all the exemplars were hand-lettered by Cliff on ruled tablet paper, using the Hunt 101 nib, Moon Palace ink, with a bit of Sumi ink added. $150, which can be paid by check or credit card, and includes 10 lessons, the 45-page manual, and 10 critiques, and the bonus as offered. All learners are encouraged to visit the studios of Heirloom Artists in Lake Oswego and receive a free, individual, two-hour orientation and demonstration.